Using the Bluetooth 3.0 chip,8 times faster than the Bluetooth 2.0,high speed connection and signal distance up to 33ft(10m). 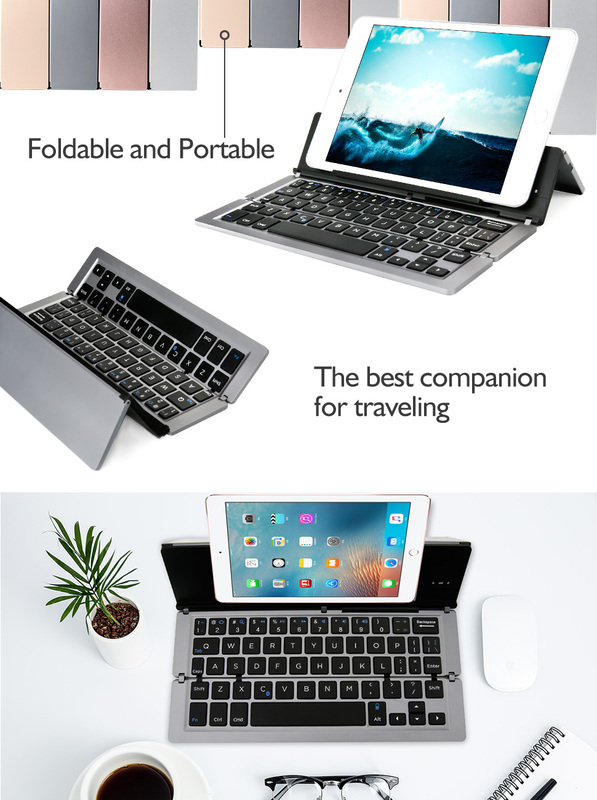 The iEGrow Pocket foldable wireless mobile keyboard and stand is the easiest, on-the-go solution to smartphone typing. Delivering over 85% the size of a desktop keyboard, the Pocket maintains fast, natural typing, and then folds into a compact, protective travel size case that easily fits into pockets and purses. And, unlike other folding keyboards, the Pocket folds between lines of keys to preserve comfortable key spacing so you can get more done, naturally. Built-in rechargeable Li-polymer battery provides more than 40 hours of effective usage time, on a full charge. 1.The battery indicator will be red when charging and go out when full charged. 2.You can press Fn+Alt to check the power of the keyboard, when the power indicator is orange means the power is not enough, when the battery indicator is green means there is enough power. It has built-in Stand holders to hold and prop up your device, tablets, MacBook and smart phones at an ideal viewing angle for simple use anywhere.